Eek! I added another Block of the Month project! However, I'm doing pretty well keeping up on all my BOMs. I have all but two up-to-date. Here are the Blocks of the Month projects I've worked on so far in April. First, last year's block party from Ruth's Stitchery. 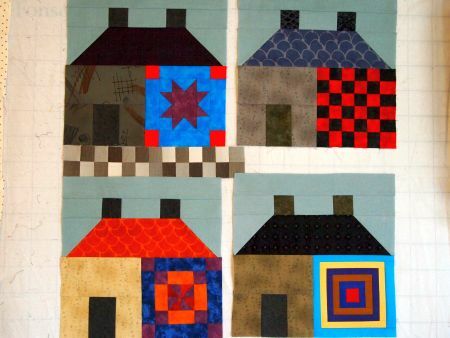 It's the "Amish With a Twist" quilt designed by Nancy Rink. The fabrics are Marcus Fabrics' Centennial Solids collection. The sashing fabric in the kit is black, but since this version came out, they've added kits with other background colors. I'm thinking I'll use a grey-blue for the sashing. It will be eight months before I have all the blocks finished, so there is plenty of time to decide! My second BOM project is "Ryokan" by Joe Wood for ThimbleCreek Quilts. When I made my fourth block, I forgot I had been using Moda Marbles for the "barn blocks." 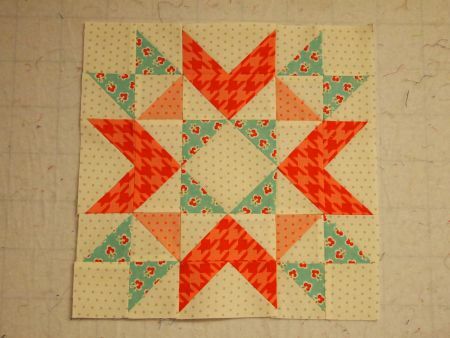 I used Kona cotton solids on the most recent one, but I think it will look fine when I get all the blocks completed. I love the way my Daiwabo ombre works for the sashing -- I think it looks like cobblestones. Next up is a current block party, also at Ruth's Stitchery. "Vintage Memories" is a BOM pattern by Sherri K. Falls for This & That Patterns. We're using "Gallery in Red and Bloue" by Faye Burgos for Marcus Fabrics. Even though I'm not a real fan of blue, I chose the blue colorway for this project. Each pair of blocks I complete makes me more glad I chose the blue fabrics. 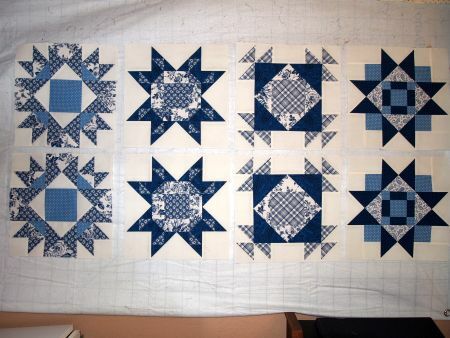 With the help of Marti Michell, I'm making rapid progress on my "Farmer's Wife" blocks. The most recent template conversion chart only had three blocks that I haven't already finished. The are (left to right) #35 Flower Basket, #54 Kitchen Woodbox and #92 Streak of Lightning. I know I have more than half the blocks complete; guess I need to count them to see how many I still have left to piece. 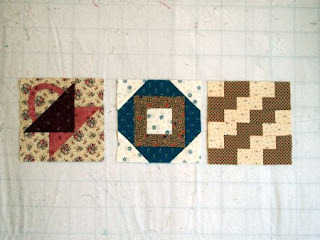 The 2010 Patchwork Party quilt also uses Marti Michell's templates. The blocks are turning out so pretty, I'm sorry I didn't make it earlier. 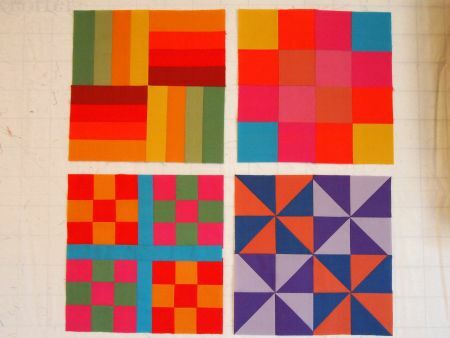 Clockwise from upper left, the blocks are: Five Geese Flying, Ladies Sashay, Rocky Mountain Chain and Bloom Where You Are Planted. The tenth block of the 2012 Designer Mystery BOM is complete. "Sunday Drive" was designed by Polly Minick and Laurie Simpson. 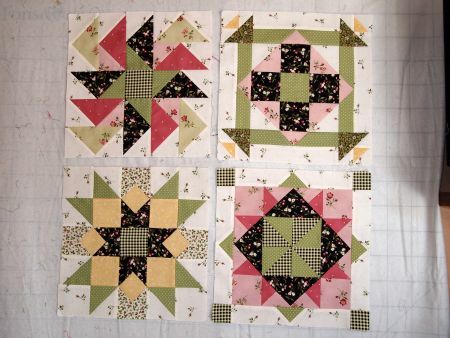 I'm really looking forward to putting this quilt together, I just love the fabrics. My newest BOM is "Toes in the Sand," which uses Julie Herman's clever Hex N More ruler. 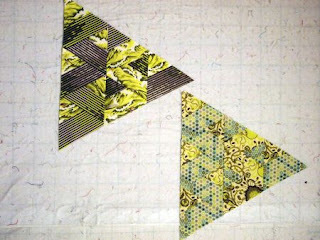 I only have two blocks so far, but I love the Tula Pink fabric used in the Quilt Asylum's version of this quilt. No Finish it Up Friday tomorrow because I'm heading south to the Pueblo Quilt Expo. Whee! Wow you've been busy already this month! I started quilting a top at the end of March as I had some unallocated time and decided to push on this week and finish it so haven't started April's tasks. We're going away for a week as well so better get cracking soon! You are super busy- as always! I haven't even gotten my goal sewing in for the last 2 days. Boo. But, my DH came home! Have a good time at the Expo! FUN stuff going here. And hey!!! I just got the binding sewn onto my 2010 Patchwork Party quilt after getting it back from Kathy's (Tamarack Shack) for quilting. Looking forward to some movie/stitching time with it this weekend. Wow I love the bright colors in your "Amish With a Twist" quilt, I was feeling all gloomy with the rain here but that really perked me up! Oh yes! I am very impressed with all of your beautiful projects here... and love the Toes in the Sand BOM too! Wonderful job on all of your projects my fellow rehab-er! Gorgeous work! I really like the contrast of the blues! The greens in the last one are beautiful and bright! I really love your work and hope that you enjoyed your quilt expo! Wow how wonderful and fun is all of this!